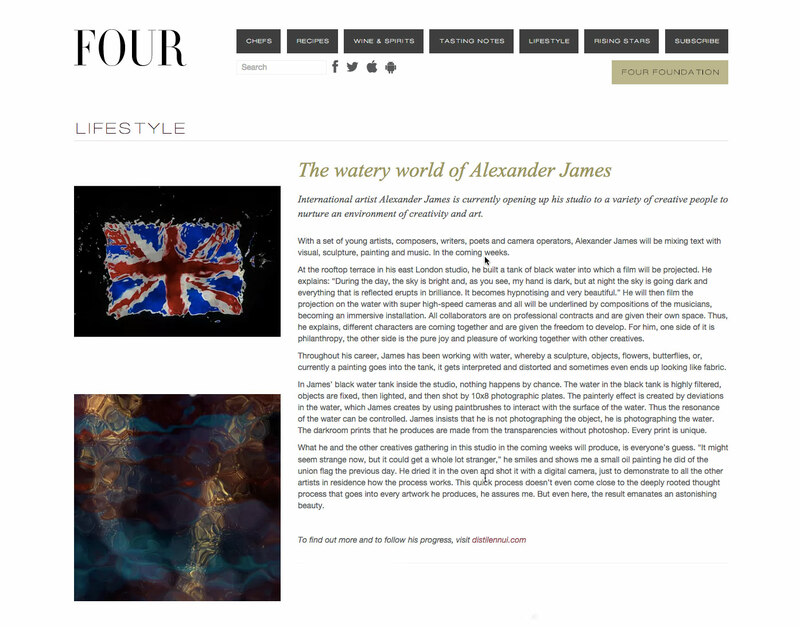 International artist Alexander James is currently opening up his studio to a variety of creative people to nurture an environment of creativity and art. With a set of young artists, composers, writers, poets and camera operators, Alexander James will be mixing text with visual, sculpture, painting and music. In the coming weeks. At the rooftop terrace in his east London studio, he built a tank of black water into which a film will be projected. He explains: “During the day, the sky is bright and, as you see, my hand is dark, but at night the sky is going dark and everything that is reflected erupts in brilliance. It becomes hypnotising and very beautiful.” He will then film the projection on the water with super high-speed cameras and all will be underlined by compositions of the musicians, becoming an immersive installation. All collaborators are on professional contracts and are given their own space. Thus, he explains, different characters are coming together and are given the freedom to develop. For him, one side of it is philanthropy, the other side is the pure joy and pleasure of working together with other creatives. Throughout his career, James has been working with water, whereby a sculpture, objects, flowers, butterflies, or, currently a painting goes into the tank, it gets interpreted and distorted and sometimes even ends up looking like fabric. In James’ black water tank inside the studio, nothing happens by chance. The water in the black tank is highly filtered, objects are fixed, then lighted, and then shot by 10x8 photographic plates. The painterly effect is created by deviations in the water, which James creates by using paintbrushes to interact with the surface of the water. Thus the resonance of the water can be controlled. James insists that he is not photographing the object, he is photographing the water. The darkroom prints that he produces are made from the transparencies without photoshop. Every print is unique. What he and the other creatives gathering in this studio in the coming weeks will produce, is everyone’s guess. “It might seem strange now, but it could get a whole lot stranger,” he smiles and shows me a small oil painting he did of the union flag the previous day. He dried it in the oven and shot it with a digital camera, just to demonstrate to all the other artists in residence how the process works. This quick process doesn’t even come close to the deeply rooted thought process that goes into every artwork he produces, he assures me. But even here, the result emanates an astonishing beauty.